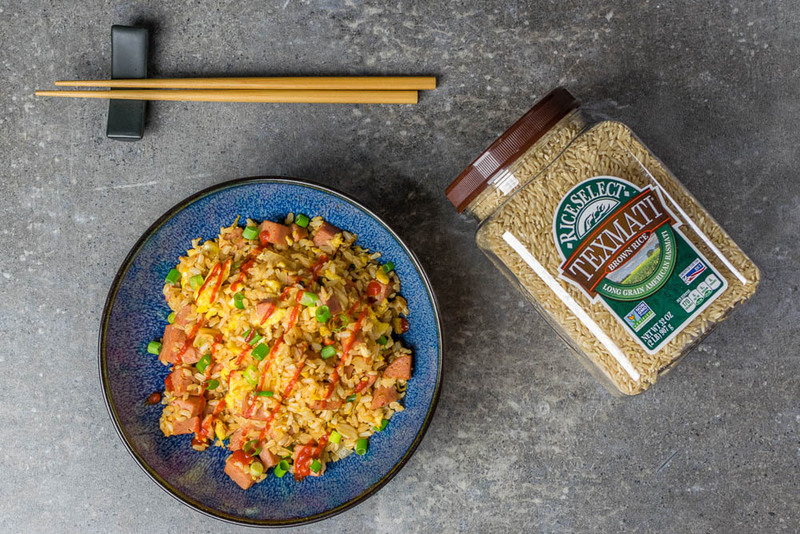 For our lightened up version of Spam and Kimchi Fried Rice we used award-winning RiceSelect Texmati® Brown Rice. This rice is the all-natural, whole grain alternative to Texmati® White Rice. It is also Non-GMO Project Verified. The inedible husk is the only part removed, making it heart-healthy with a low glycemic index value. The nutty taste and slightly chewy texture make it ideal for fried rice like ours. In addition to RiceSelect Texmati® Brown Rice, we used a few other ingredients to make this dish a bit healthier. The first being low sodium soy sauce. With soy sauce being an ingredient that is used in a fairly large quantity, it needed a makeover. Lower sodium soy sauce tastes the same with less salt. The second ingredient we changed up was the Spam. By using Spam Lite instead of the regular version you have 33% fewer calories, 50% less fat, and 25% less sodium. All good things when you are working on a new cosplay! Want to make this delicious recipe or maybe you want to try your own recipe with RiceSelect Texmati® Brown Rice? Well, you’re in luck! The folks over at RiceSelect have graciously given us two canisters of RiceSelect Texmati® Brown Rice and a RiceSelect tote bag (this thing is huge and perfect for the Farmers Market) to give away. All you have to do is enter our raffle below for a chance to win! The winner will be notified by email! Good Luck! 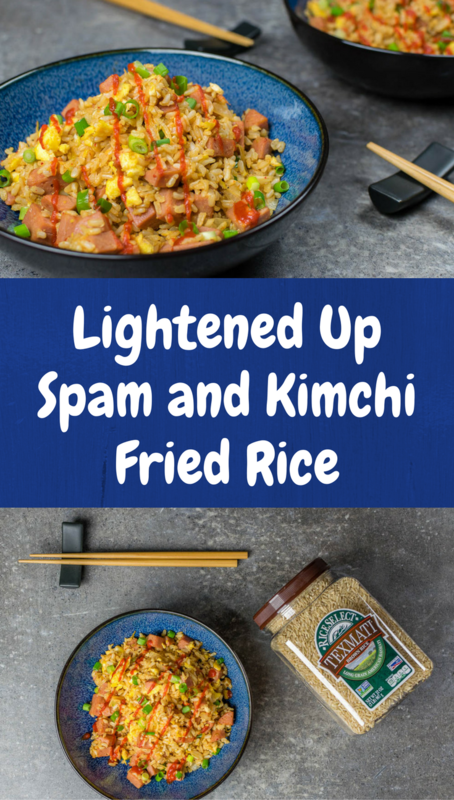 While this may not be the healthiest recipe, the substitutions in it make it a bit healthier than your traditional Spam and Kimchi Fried Rice. This is a great recipe for a cheat meal when you don't completely want to ruin your progress but still need comfort food. Prepare rice per package instructions and let cool. Heat 1 tsp of sesame oil and scramble your eggs. Heat remaining 2 tsps of sesame oil. Add Spam and cook until Spam gets a nice crispiness to it. Add kimchi about half way through. Once both are cooked, add rice, egg, soy sauce, and kimchi juice. Toss until combined and heated through. Toss a few more times. Add a drizzle of Sriracha. To reduce calories and fat further, you can use cooking spray in lieu of sesame oil though the flavor will be different. This will lower your calories by 30 calories a serving. *The Geeks were compensated to facilitate this write-up; We were also provided information about RiceSelect Texmati Brown Rice. All opinions are wholly our own. View our Disclosure Policy for more info. I never thought of adding kimchi to my fried rice. So a brilliant weeknight recipe idea. Can’t wait to try it soon. YUM! I just had spam and eggs this morning for breakfast, lol! Reminds me of my life in Hawaii. Yum, kimchi fried rice sounds delicious and so creative! I am such a fan of doing spins on traditional recipes. Kimchi fried rice is an awesome idea! I agree with Peter. 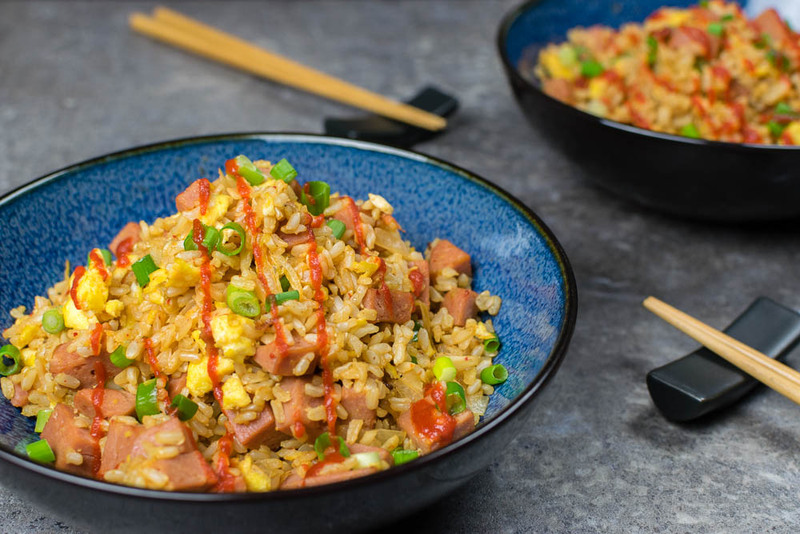 Spam is #1 in Hawaii and coupled with the kimchi fried rice, I’ll bet that this recipe is dynamite! Yum looks delicious. I want to make this one day this week for dinner!